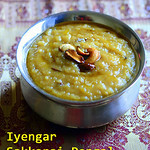 Iyengar style sweet pongal / Sakkarai pongal recipe was in my try list for long time. Recently I bought a cookbook named “Iyengar Pandigai Samayal “ from Kumbakonam. All the Iyengar specialty recipes are discussed in that book according to the festival. 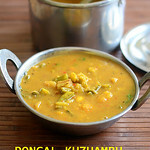 I found a traditional Sakkarai Pongal recipe prepared using a pot ( bronze pot/ Venkala paanai). 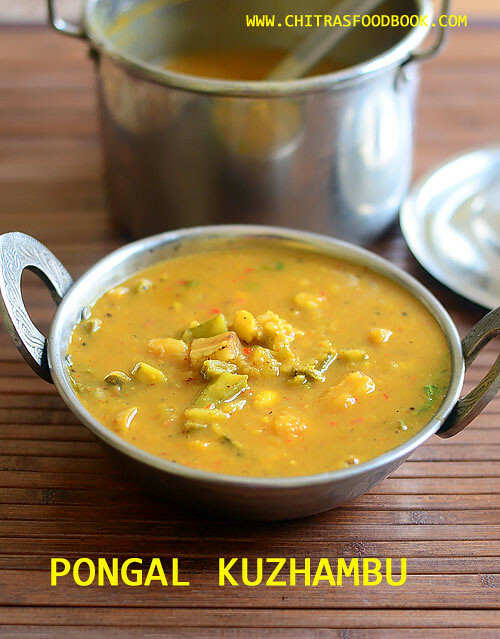 When I saw that recipe, I immediately called my school friend Sumi who is the only source for my Tamil Iyengar Recipes in my website to confirm the recipe and ingredients. She shared all the most important tips to get perfect Perumal temple style Sakkarai Pongal. Thank you so much Sumi. I became very happy and tried it for my Thursday Guru Pooja Neivedyam yesterday. It came out finger licking good. But for your help, this post would not have come up today :). My friend told me to prepare this pongal in a bronze pot to get the authentic flavor and taste. But my pot is too big to make small quantity. So I used a pressure cooker to ease my job. My job was done in less than 30 minutes. Friends, I have shared all the tips shared by my friend Sumi if you like to try the authentic version like temples. If you wish, you can prepare in a bronze pot like temples or use your cooker to make it quickly. Choice is yours ! But taste wise pot pongal is the best. Next year during pongal festival, I will try to buy a small pot and make a separate & detailed post. Now lets see how to make Iyengar style sakkarai pongal recipe / Sweet pongal recipe with step by step pictures. I will post a video tonight. To make temple style pongal, you should cook the rice & dal in an open pot, preferably in a bronze pot as it helps to retain the heat longer & maintain the consistency of pongal. Addition of Pachai karpooram/ edible camphor is a must in Iyengar Pongal. They also use freshly made ghee from butter to roast the cashews and add to pongal for neivedyam. They do not use the ghee used for regular cooking. So the taste & flavor of fresh ghee matters a lot. Never use boiled rice. Always use good quality Sona masoori rice for best taste. Do not use basmati rice as well. 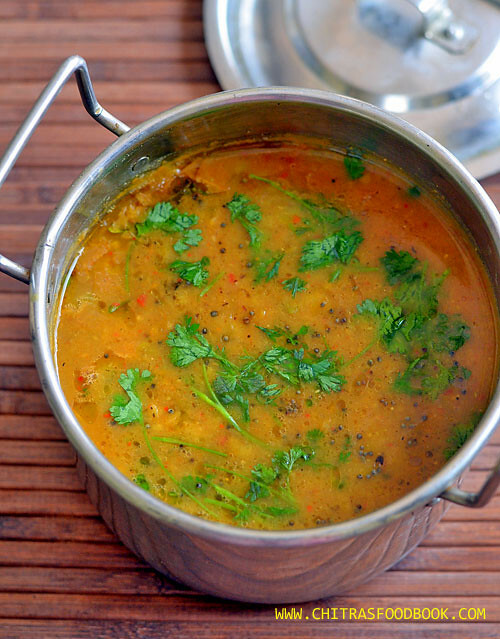 Roasting moong dal is an optional step. Some people add it as such. My friend told me to soak rice & moong dal in milk & water for 15 to 30 minutes to cook quickly. But I din’t soak it as I used pressure cooker. Milk should be used in Iyengar pongal. Some people cook the rice only with milk. But I have used a combination of water & milk as suggested by my friend. The quantity of milk may vary based on the consistency of pongal. So reserve some boiled milk and add it while serving if needed. I have used rice & jaggery in the ratio of 1: 2. Some people use 1:1.5 for mild sweet taste. It all depends on your taste buds. How to make Iyengar style sweet pongal recipe / sakkarai pongal with milk & jaggery. In a pressure cooker base, heat 1 tsp ghee. Roast moong dal for a minute. Add raw rice to it and roast for another minute. Wash them. Add water + milk to the cooker along with a pinch of salt. Pressure cook in very low flame for 2 whistles. Mash the cooked rice & dal. Boil and melt jaggery adding water and strain the syrup. Add jaggery syrup, 1 tbsp ghee to the mashed rice. Mix well and boil till semi solid in consistency. Switch off flame. Add cardamom powder, a pinch of edible camphor and cashews roasted in ghee. Mix well and remove from flame. Garnish with more cashews if you like and serve hot ! In a pressure cooker base, heat 1 tsp of ghee. Roast yellow moong dal for a minute. To this, add rice and roast for one more minute. Remove the cooker and wash the rice + dal. Drain the water and keep it back in flame. Add milk + water to the washed rice, dal mixture. Add a pinch of salt as well. Mix well. Pressure cook in very low flame for 2 whistles.Open the cooker after steam is released. Mash the rice and dal very well with a ladle or masher. Make sure rice + dal is mashed properly. Add more boiled milk or water if needed. Mix well. Keep the cooker aside. Add the syrup to the mashed rice and mix well. Add little more hot water or milk if the pongal is too thick at this stage. Add 1 tbsp ghee to avoid sticking of rice to the bottom of cooker. Mix well and boil till pongal comes to semi solid in consistency. Do not cook till too thick. It will harden as it cools down. So make it semi thick. Remove from the flame. 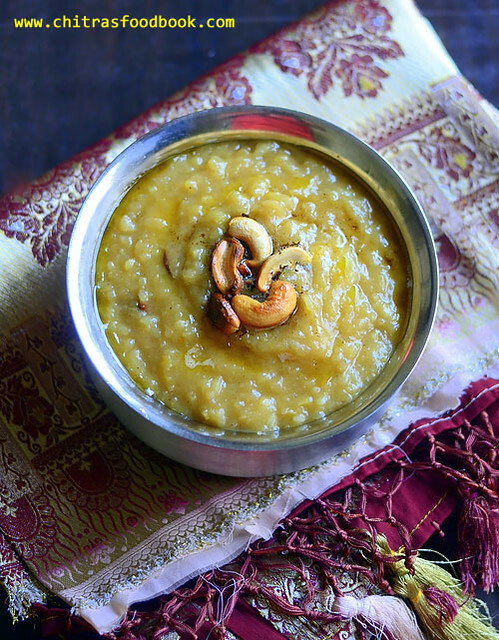 Roast cashews in the remaining 1 tbsp ghee and add to pongal. ( I used fresh butter, melted to make ghee and roasted the cashews as suggested by my friend.) Add cardamom powder, a pinch of edible camphor and mix well. Add 1 tbsp more ghee and few more roasted cashews for garnishing. Serve hot ! The ratio of rice & water depends on the quality of rice. Old rice takes more water. For pongal festival, we buy new rice ( pudhu arisi).So it takes less water. I used 1:5 ratio of rice and water. You can also use 1:4 or 1:6 based on the rice. Similarly the quantity of jaggery depends on the type of jaggery. If you use paagu vellam, you can add 1:1.5 ratio of rice & jaggery else use 1:2 as I did to get nice color and taste. If you feel the sweetness is more, you can add more boiled milk or hot water to reduce the sweetness. Edible camphor is the most important to get temple flavor. You can also add powdered nutmeg and roasted cloves if you like. Do not reduce ghee than the mentioned quantity. You must add more ghee to get ghee dripping pongal else pongal looks dry. 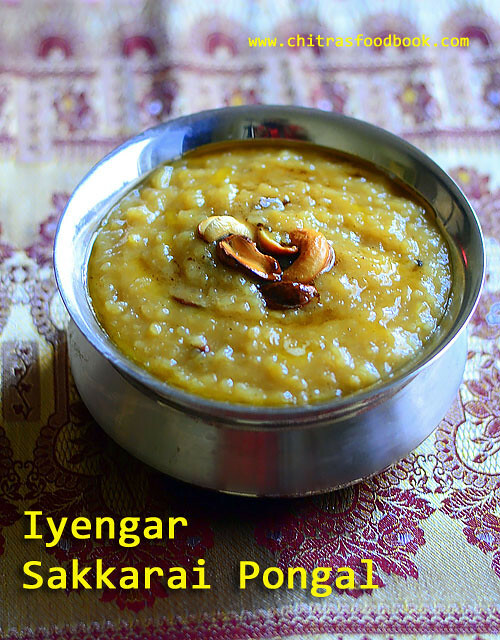 Try this easy, yummy Iyengar style Sakkarai pongal for this Pongal festival at home and enjoy ! 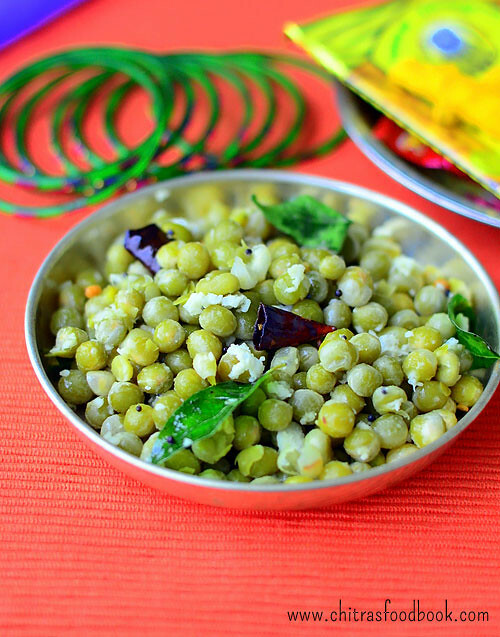 I had to post this Green Peas Sundal Recipe (Pattani sundal in Tamil) last week during Navaratri. But I couldn’t do it due to some personal work. I am yet to start Diwali recipes. So today I am posting this recipe from my draft. From tomorrow, you can expect some yummy Diwali sweets and snacks from here : )). Pattani sundal is one of the easy and yummy sundal varieties we make during Navaratri for neivedyam. 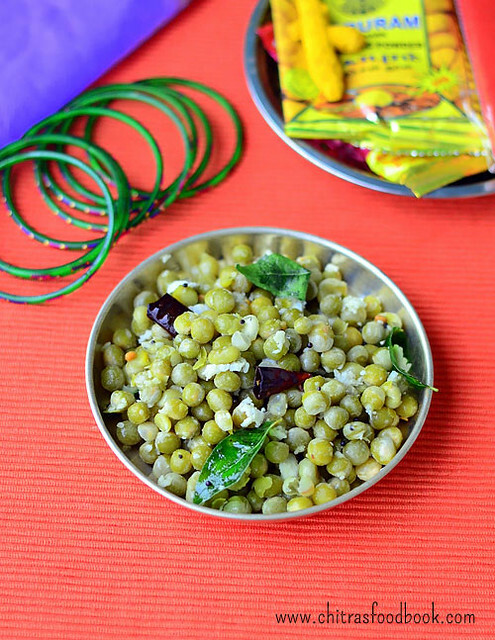 Last week I prepared this sundal recipe for Golu. I used dried green peas, soaked it overnight and prepared this sundal. If you have frozen or fresh green peas (pachai pattani) in hand, your job becomes easier. Cooking green peas perfectly is a bit tricky. Most of us face the problem of peas becoming mushy after pressure cooking. Proper soaking and addition of salt while pressure cooking helps to retain its shape and cooks soft as well. Recently my neighbor shared this sundal by adding masala. It was tasting great and truly flavorful. But I made it in the usual way as we need to avoid onion & garlic for neivedyam. Soon I will share my neighbor’s masala sundal recipe. 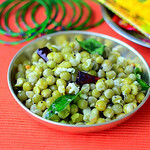 For variations, you can make this sundal with white peas or yellow peas as well. 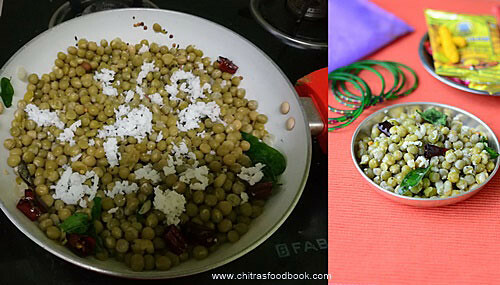 Today lets see how to make green peas sundal recipe with step by step pictures. Wash and soak the dried green peas for 8 hours. Pressure cook the green peas adding soaked water and salt in low flame for 2 whistles. Drain the excess water if any and keep the cooked peas aside. Grind coconut, chilli and cumin seeds to a coarse paste without water. Temper mustard seeds, curry leaves, hing and add cooked peas, ground paste. Mix till raw smell goes off. Sprinkle some lemon juice if you like. Wash and soak dried green peas for 8 hours or overnight.Pressure cook it adding enough water and salt in low flame ofr 2 whistles. Adding salt helps to prevent peas becoming mushy.So don't forget to add salt.Remove after the steam is released. Drain in a colander. Grind coconut, chilli and cumin seeds to a coarse paste without adding water. Heat coconut oil in a kadai. Splutter mustard seeds, curry leaves, hing and pinched red chilli. Add cooked peas, ground coconut paste and saute till raw smell goes off.You can sprinkle some lemon juice if you like. Serve warm ! Dried green peas should be soaked at least for 6 to 8 hours.If using fresh peas, no need to soak it. Addition of salt while cooking peas helps to prevent it becoming mushy. For variations, you can add grated coconut instead of grinding it. 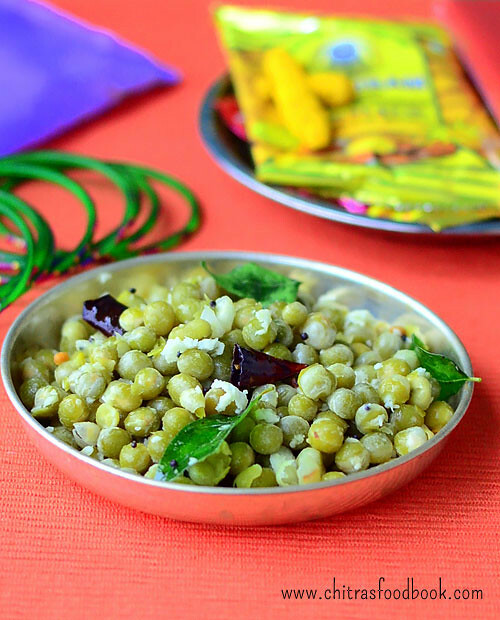 Try this easy, kids friendly Green peas sundal recipe at home and share your feedback with me . 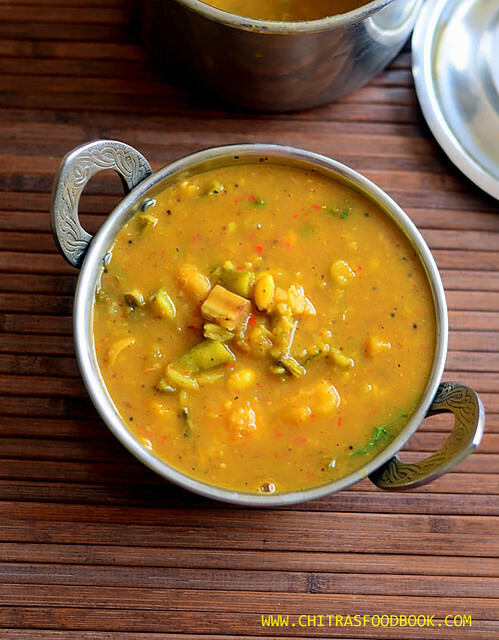 South Indian, North Indian Navratri Recipes for 9 days golu at home . In this post, I have framed a list of Navarathri prasadam recipes of Tamil nadu, Andhra and North India for nine days as per my readers request. 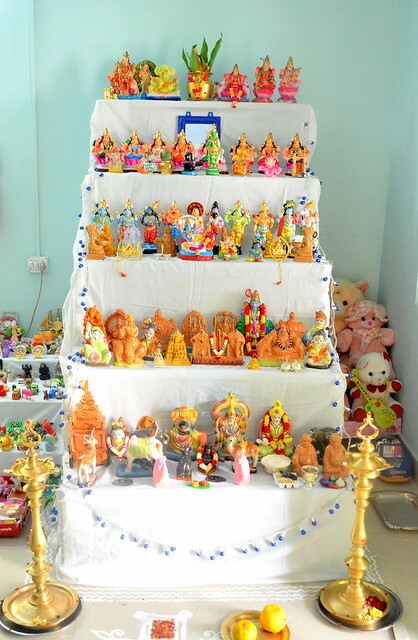 Last year I made a detailed post on how to keep golu at home. 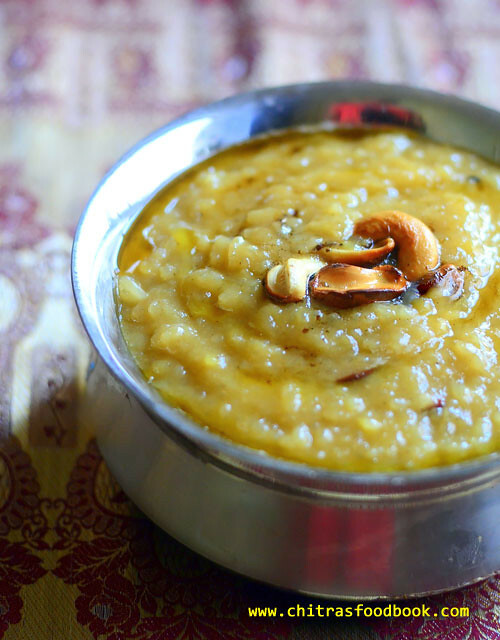 At that time, many of my readers asked me to make a post on Navratri naivedyam recipes list. So today I have come up with the list of prasad recipes like rice varieties, sweets, sundal recipes/snacks based on South Indian and North Indian Navratri festival. Hope this post will be helpful to you all. Here is the picture of our last year’s Golu! Do refer my Navaratri recipes collection for more ideas. In Tamil nadu, during Navarathri people worship Goddess Durga for the first three days, Goddess Lakshmi for the second three days and Goddess Saraswathi for the last 3 days. People used to offer some sweets and sundal recipes for God in front of Golu. Even though navarathri is a 9 days festival, the day that comes before Navarathri i.e Amavasya and the day after Navratri where we celebrate the victory of good over evil as Vijayadasami, comes to 11 days. Married ladies & young girls are invited to home and we give thaamboolam along with a sundal variety or sweet as Golu prasadham. We usually keep the golu on Pradhamai day evening. So we offer sweet pongal/sakkarai pongal and chana sundal/kondakadalai sundal for neivedyam and we offer some fruits, rock candy on Vijayadasami day. I have shared this table of naivedyam recipes by referring Nataraja Deekshithar’s blog post. He had given a clear explanation about Navaratri celebration in temples and its importance. He has also mentioned the list of flowers, leaves, kolam, fruits, Neivedyam and Raaga to be used for Navratri 9 days. I took the neivedyam recipes, added 2 more recipes for each day morning & evening neivedyam and framed this table. I have given different sweet recipes, rice variety and sundal recipes for 9 days. You can alter the sweets and sundal varieties based on your liking. But the rice variety given here is as per the tradition according to Deekshithar’s post. So you can follow the same. I have linked all the recipes to my post. You can click on that to view the respective ones. I am yet to post few sundal recipes in this list. I will do it this week. I hope this table would be useful for people who wants to get some ideas for Navratri recipes. Ok, lets check the table below. Apart from this list, you can refer more recipes in my collection of Navratri recipes post. Do check it ! In Andhra Pradesh, Navadurga ( Nine aspects of Goddess Durga) is worshipped during Navratri. Varieties of prasadam is offered to God on these nine days. In North India, People worship nine different forms of Maa Durga. People perform fasting, pooja and pray the Goddess by offering nine different bhog on these 9 days. Lets see them below. Sorry, I have not shared Vrat ka recipes ideas. I have just mentioned the sweet recipes and the ingredients you can offer on these 9 days. DISCLAIMER : I have made this list based on the inputs from various sources. Please alter them according to your tradition by consulting your family elders. 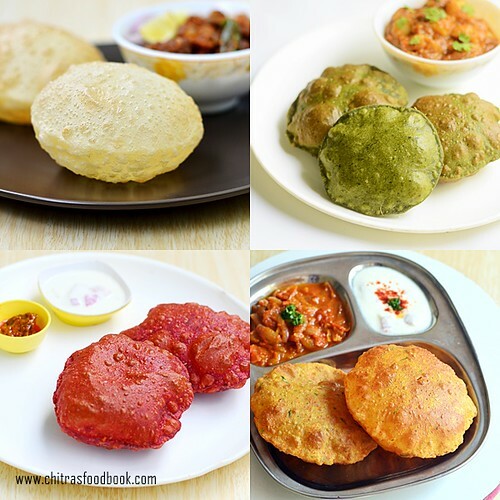 Collection of 10 different puri recipes / poori varieties – Indian deep fried bread. 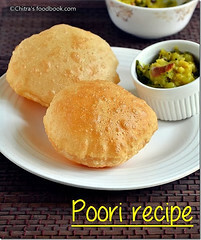 I make Poori recipe / Puri recipe for breakfast regularly during weekends. When I was a beginner in cooking, making a puffy poori just like hotel ones was my dream. Slowly my dream came true by practice . 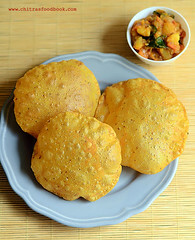 After making several attempts, I got to know the technique, tips and tricks for making puffy and soft puri.In this post, I have shared all the possible tips & tricks to make perfect poori based on my observation. Hope these points would be useful for beginners. Once I started making it perfect, I got tempted to try different types of puri recipes. 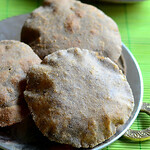 So I prepared varieties of poori along with different side dish recipes for our Sunday breakfast and blogged the same. This is how I got a collection of these 10 poori varieties in my website . 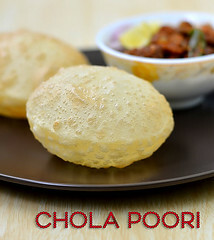 You can find basic poori/puri recipe with wheat flour(atta in Hindi), Chola poori/Maida puri, Tomato poori, Paneer stuffed puri, Spinach/ Palak poori, Beetroot poori, Potato poori, Kutta atta puri, Spicy masala puri, Finger millet/Ragi poori in this collection. I have given step by step pictures for all these recipes and few video recipes as well. 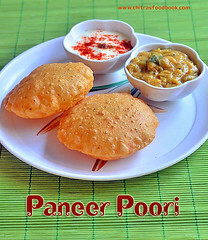 I am yet to try North Indian stuffed puri recipes like urad dal puri, peas stuffed puri, dal poori, bharva puri, bhatura and the most popular Pani puri recipe and puri recipes for vrat/fasting like rajgira puri and Shingare ki puri. I will try to add them in this list soon. Generally Kids love to eat poori more than roti. So you can try these varieties at home for their breakfast or evening snacks and make it healthy with some stuffing. Ok, lets see the collection of 10 poori recipes / Puri recipes / Indian flat bread varieties to make at home for weekend breakfast & special occasions. Please click on the images to view the recipe. Addition of rava/sooji/semolina in the wheat flour helps to make puffy poori. Adding a dash of ghee helps to keep the puri soft. Unlike chapathi dough, poori dough has to be tight and thick. Dough should be kneaded well to make it smooth and crack free. Resting time is not necessary for the dough. Rolling should be thicker than roti to get puffed poori. Do not dust too much in flour. Oil will get more sediments. Always dust off the excess flour coated in the rolled poori by patting between your hands. Oil temperature should be checked before dropping the poori. If oil temperature is less, puri will sank in oil and doesn't puff up. Oil should not be smoky hot too. Color of poori will become dark. Poori should not be stacked one over the other. Last week I made Dahi aloo recipe ( Dahi wale aloo/ dahi aloo ki sabzi) as side dish for Kuttu ki puri. In North India, people make dahi wale aloo during fast/Vrat for roti or poori. 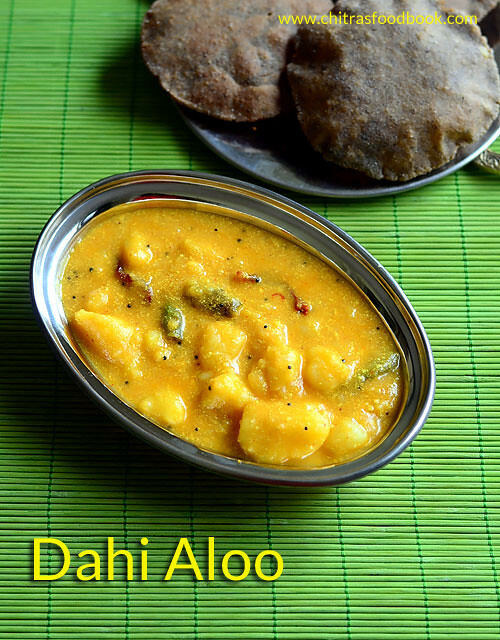 Dahi aloo is a yogurt based/curd based dish in which boiled potatoes are cooked with spices. It is most popular in Rajasthan. I could relate its taste to Dahi kadhi. I followed this recipe from Maayeka. We liked it with kuttu atta poori. This Dahi aloo sabzi goes well with Rajgira poori and Sabudana thalipeeth too. 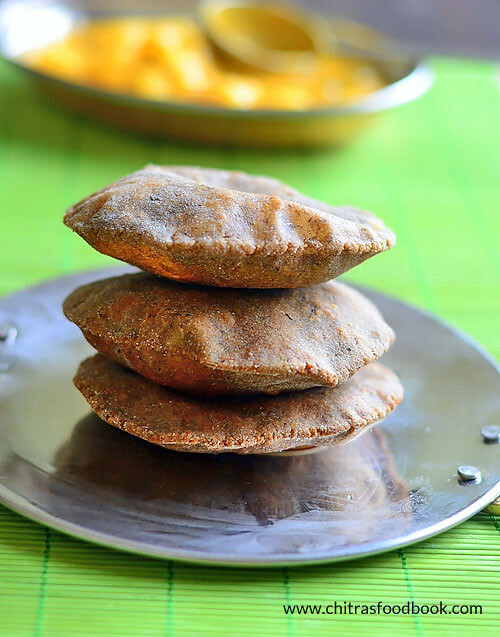 Kuttu ki puri recipe (Buckwheat flour poori) with step by step pictures - After a long time I am sharing a poori variety in my space. 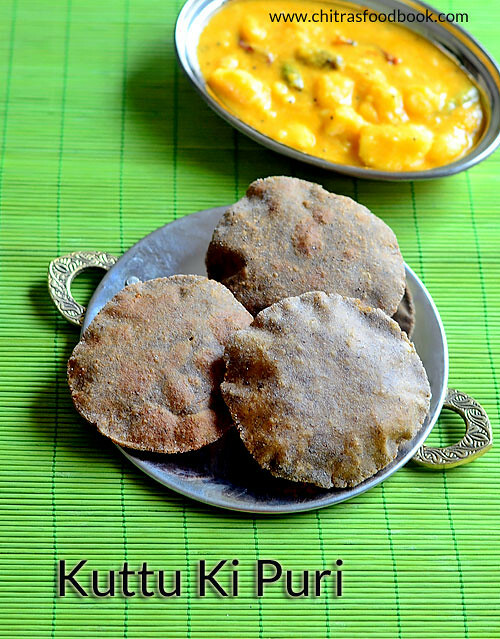 When I was browsing for North Indian puri recipes, I came across this kuttu ki puri ( Kuttu atta in Hindi, Buckwheat flour in English) under Navratri Vrat ka khana recipes. Actually the term, Kuttu atta was very new to me. When I browsed for its health benefits, I was amazed to know it. Buckwheat is a very healthy grain that is rich in protein, fiber, good for weight loss, increases good cholesterol, detoxifies body, keeps the tummy full for long time and much more. So buckwheat flour recipes are ideal food for fasting. But I read that buckwheat flour increases heat of the body. So its advised to consume it along with curd based side dishes. So I made this puri for our Sunday breakfast along with no onion no garlic dahi aloo as side dish. Puri came out well. Though it was not so tasty like our regular wheat flour poori, it was good to eat. 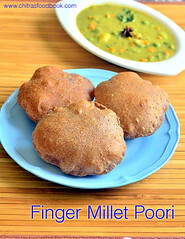 Its taste and color reminded finger millet poori to me. We had a satisfaction of having a healthy food even though its a deep fried stuff. Kids don’t like this poori. So to make them eat, you can either add equal quantity of plain wheat flour & buckwheat flour or more wheat flour and make it more tasty. I don’t think Kuttu atta is not easily available all the places.So you can buy it online from Big basket, Amazon as I did. 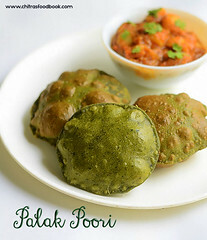 Ok, Lets see how to make kuttu atta ki poori recipe with step by step pictures. 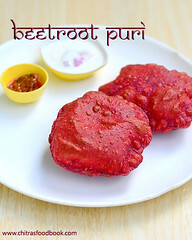 You can also check out my Nachni puri/ Ragi poori, Palak Poori, Beetroot poori, Paneer poori, Potato poori, Masala poori and Tomato poori recipes. Here is a picture of kuttu ki atta / buckwheat flour for your reference. 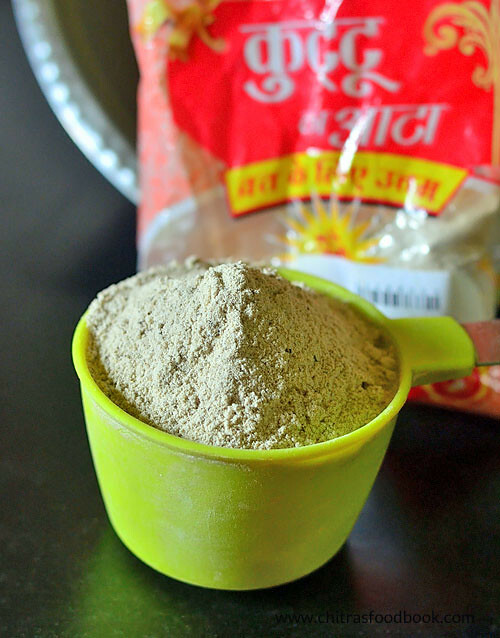 Take kuttu atta/buckwheat flour in a wide bowl/plate. Pressure cook potato till soft, peel the skin and mash it. Add the mashed potato, pepper powder, salt, sooji and ghee to the flour. Mix well.Add water gradually and make smooth dough. Roll thick poori and set aside. Heat oil and deep fry the poori on both sides. Remove and serve hot with dahi aloo or any side dish. Wash and pressure cook a big potato.Peel the skin and mash it very well. There should not be any small pieces. In a wide bowl, take the kuttu atta, pepper powder, salt, mashed potato, sooji and ghee.Mix till crumbly. Potato should spread well with the flour. Add water gradually and make a thick, tight, non-sticky dough. Knead with your hands for 5 minutes. Cover and let it rest for 5 minutes. Take a ball sized dough, dust in buckwheat flour and roll small, thick poori. Heat oil to deep fry. Check the oil temperature by dropping a pinch of dough. If it rises to the top immediately, oil heat is just right. No problem if the oil starts to smoke slightly. Now lower the flame and drop the puri. When it starts to rise, press with a ladle and it will puff up slightly.Flip it and cook the other side till golden and crispy. Remove & drain in a tissue paper. Serve with curd based dishes like raita, dahi aloo, dahi arbi etc. 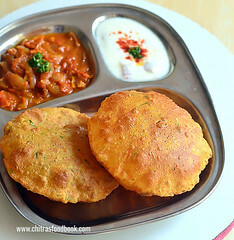 You can make this poori adding equal quantity of buckwheat flour & plain wheat flour. Adding sooji helps to keep the poori crispy. Ghee & potato helps to make the puri soft. 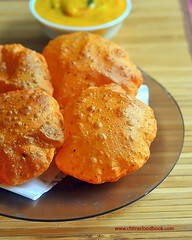 This poori puffs up only when you roll it thick and oil should be slightly smoky hot. Kuttu ki atta poori is ready to serve. Try this for Navratri vrat food.